Our Colonial Room is a haven of cool tranquillity. In classic colonial style this room is bathed in light and warmed by individually carved reclaimed teak furnishings, a welcoming fireplace and a comfy leather armchair with plenty to read. You simply can’t help but relax. The spacious four poster bed using was created using traditional methods by skilled craftsmen in Indonesia and lends a sense of grand romance. 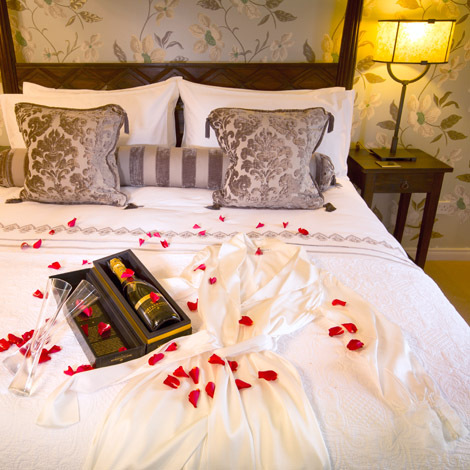 Our most opulent bedroom, the Colonial Room has views of the mature garden and green fields from both windows. A view you can still enjoy from the roll top bath in the bright en-suite bathroom. Fresh fruit and flowers add that finishing touch to your romantic countryside hide away. Celebrating an occasion? Please let us know, we want to make your experience as special as possible. We enjoy tailoring your stay to suit you, all you have to do is ask.